Unemployment at 4.9%. More than 75 straight months of continuous job growth. Per capita GDP at an all-time high. Summer’s here. But nobody’s dancing in the streets. First, note that even as real per capita GDP continues to reach new peaks, the typical American adult (i.e., the person at the 50th percentile) in 2014 was no better off than in the last two recessions. Median personal income was down about 5% from about a decade ago. The rising tide is clearly not lifting all boats. The more politicians crow about the improving economy and the more economists say we are at “full employment,” the greater the disconnect becomes. These graphs indicate that it by no means a new thing, at least in the labor market. The male employment/population ratio has been falling since 1969, when it was 95%. The female employment ratio has been rising steadily since at least the late 1940s, when it was less than half the current level. During the boom decade of the 1990s, the male employment/population ratio fell by about half a point, while the female ratio rose sharply, from 71% to 74.5%. Male employment was hit harder than female employment during the 2008-2009 recession (men’s employment fell from 89% to 81%, women’s from 74.5% to 69%). Men’s employment has actually risen faster than women’s during the post-2009 recovery (ratio up by about 4 points vs. 2 points), but again, the male employment ratio is down about 5 points from 1990, whereas the female employment ratio is unchanged. The top 1% are different. Yes, they own more financial assets. 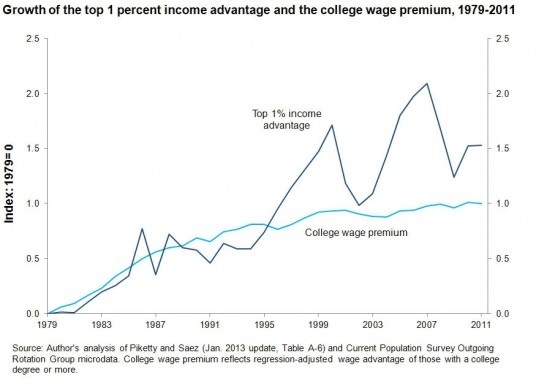 We see that the second half of the 1990s is the first prolonged period when the top 1%’s income soared above that of the college educated in general; it coincided with the dot-com boom/bubble. We see a similar takeoff during the mid-2000s housing bubble and stock boom. In the market corrections/crashes that began in 2000 and 2007, we see the top 1%’s advantage mostly, but not completely, disappear. A combination of stock options, stock-market-based bonuses, and “Takes money to make money” seems to be at work here. The graph seems to be at odds with the common argument (Greg Mankiw’s?) that the top 1% deserve all they get because they are so much more productive, as it seems doubtful that their superior productivity deserts them in bad times.